Square and well covered by its coat, the Tibetan Terrier is a powerful, medium sized dog. The skull is neither broad nor fine, and narrows toward the front. The eyes are large, dark and set far apart. Heavily feathered, v-shaped ears hang down on the sides of the head. The feet are distinctively large, round and flat, and appear to be well adapted to walking in snow. The entire body and head are covered with a profuse coat that covers the face and hangs straight or wavy from the body. The Tibetan Terrier can be any color. Height (Male) 15 - 16"
Common Misspellings Tibettan Terrier, Tibeten Tarrier or Tibetan Terier. Highly sensitive to her masters wishes, the Tibetan Terrier can be a frolicsome little sprite in the backyard and immediately revert back to well mannered house pet once inside. The Tibetan Terrier gets along well with other dogs and pets, and can generally be assimilated into any houses animal hierarchy with ease. The dog tends to be wary of strangers, though, and has a habit of making itself scarce when there are visitors in the house. Due to its sensitive nature, harsh or intense training is not suggested for this breed. The dog enjoys a long walk or a romp in a field; in a pinch, the Tibetan Terrier can be exercised in a backyard. 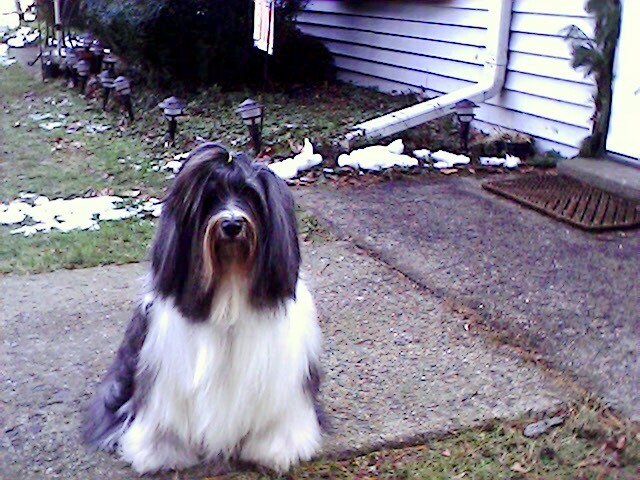 The Tibetan Terrier is not suited to outdoor living, and should always be allowed to sleep inside. The dogs long coat needs brushing two to three times a week, and may require regular washing. Professional grooming is also recommended every few months. Health concerns of note for the Tibetan Terrier include lens luxation, progressive retinal atrophy, cataracts, ceroid lipofuscinosis, canine hip dysplasia and patellar luxation. So called because the only road leading to it was destroyed in an earthquake during the 14th century, the Lost Valley kept the Tibetan Terrier hidden and obscure for many centuries. One of the earliest companion breeds, the Tibetan Terrier was not expected to earn its keep through labor like other dogs of its time, though occasionally it would voluntarily lend a paw with herding and household chores. These dogs were alternatively called Holy Dogs and Luck Bringers by their owners, and were though to impart good fortune and long life on their owners.Those who endeavored to journey to the Lost Valley were often given a Tibetan Terrier as a gift, and in 1920 an Indian physician by the name of Dr. Grieg received one of these dogs after treating a Tibetan woman in the valley. Dr. Grieg brought a few of these dogs to England and established a kennel. English speakers called the dogs terriers because its size was similar to that of a terrier, but that is about as far as the similarity goes. The breed began to appear in dog shows in England during the 1930s, and was introduced to the United States in 1956. 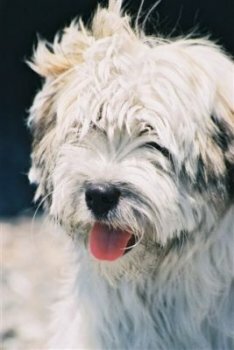 The American Kennel Club recognized the Tibetan Terrier in 1973.